Mystics have known for a long time that a human consists of body, mind and spirit. Today, we worry a lot about the first two, while ignoring the last. Yet only the last will stay. For ever. The spirit is that deep eternal part of us which connects to wholeness, to the divine, to absolute love and beauty. The body looks like a wonderful piece of mechanics, but it is much more. It’s made of energy, structured energy. The mind is a mystery. 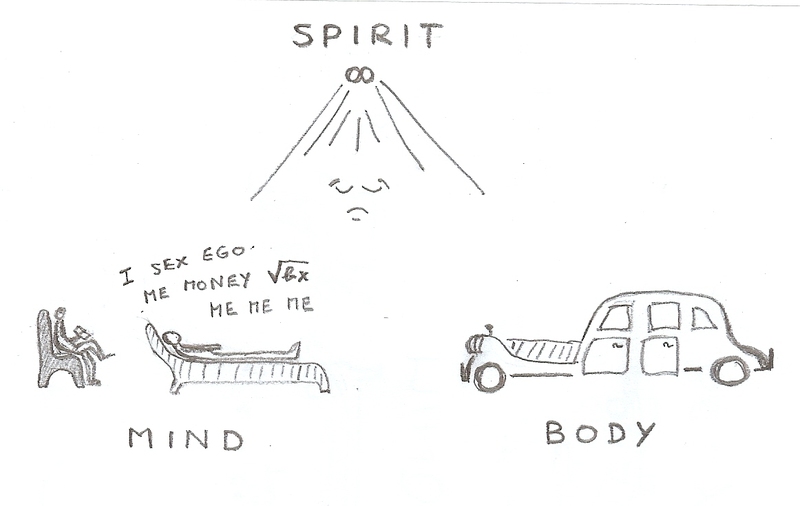 Is it “material” or something fluid and elusive in between the body and the spirit? Fearing death becomes acute when you forget the spirit. But when all your life strives to align to what the spirit keeps whispering to the lower parts of you, fear reduces, the ego makes itself scarce and lightness fills your body and your mind, wiping away the heavy stuff. The purpose of life is complete alignment with the spirit. Whenever we forget this and lose our way on secondary objectives, invariably assigned by ego, things quickly turn sour. Which is exactly what is happening at the collective level. The global crisis, with all its multiple aspects, is simply the vibrational consequence of humans ignoring their higher selves connected to the divine. Fear not, constantly listen to your spirit.